Lining up the perfect photo just to realize that you're out of storage space can be frustrating. Adding a SanDisk memory card to your camera or mobile device is an easy way to make sure you have the room for more photos and videos. Ultra Plus microSDHC cards are designed for Android smartphones and tablets. Transfers data at up to 40MB per second. Ultra Plus microSDHC cards are designed for Android smartphones and tablets. SanDisk Memory Zone app simplifies file backup on your Android device. Transfers data at up to 40MB per second. Moves files at up to twice the speed of the average card. 128GB memory card is great for recording full HD video. With a breakthrough capacity of up to 400GB* plus Class 10 speed rating, you can shoot and store even more hours of Full HD video2, high quality photos and other files without worrying about running out of room. SanDisk® cards are compatible with Android™ smartphones and tablets. Choosing the right card isn't an exact science. The chart shows example combinations of music, videos and photographs that you can store on a SanDisk Ultra® PLUS microSD™ Card. Maybe you want to take more photos, or bring your entire music collection with you. 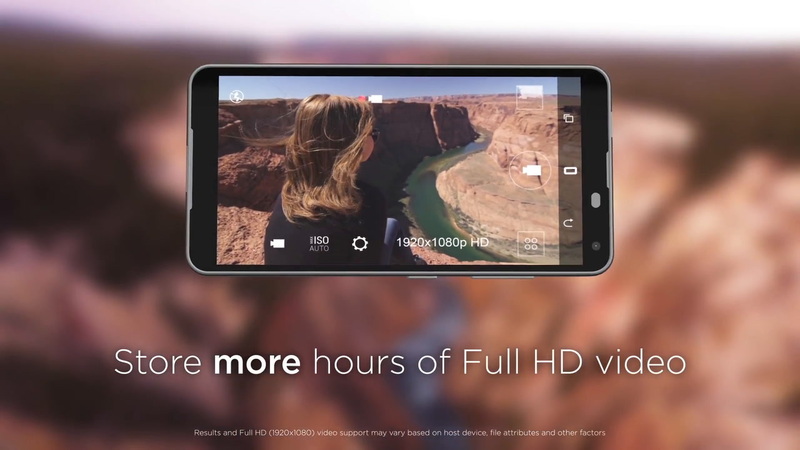 Or you might need enough space to watch movies and record high-quality 4K UHD video. See which memory card fits your life perfectly. *Ultra PLUS microSD cards: Video speeds Class 10 (V10) 32GB-400GB only. Extreme microSD cards: Video Speed Class 30 (V30) 32GB-128GB only. Faster read speeds mean you can transfer photos more rapidly from your card, so you can spend more time capturing and less time waiting. Based on internal testing; performance may be lower depending on host device, interface, usage conditions and other factors. 1MB=1,000,000 bytes. The higher the write speed, the more quick-fire shots you can take without waiting for the card to catch up. Performance may vary based on host device. 1MB=1,000,000 bytes. *Ultra PLUS microSD cards: Video speeds Class 10 (V10) 32GB-400GB only. Speed Class and UHS (Ultra High Speed) Class symbols indicate minimum sustained writing performance to record video. This is important for camcorders, video recorders and other recording devices to ensure smooth playback. * 1GB=1,000,000,000 bytes. Actual user storage less. ** For 64GB-400GB: Up to 100MB/s read speed; write speed lower. For 16GB-32GB: Up to 98MB/s read speed; write speed lower. 1 Results may vary based on host device, app type and other factors. 2 Full HD (1920x1080) video support may vary based upon host device, file attributes, and other factors. See: www.sandisk.com/HD. 3 Card only. See www.sandisk.com/proof. 5 Download and installation required; see www.sandiskmemoryzone.com. 6 Based on 4.1GB transfer of photos (avg. file 3.5MB) with USB 3.0 reader. Results may vary based on host device, file attributes and other factors. © 2018 Western Digital Corporation or its affiliates. All rights reserved. SanDisk, the SanDisk logo, and SanDisk Ultra are registered trademarks or trademarks of Western Digital Corporation or its affiliates in the US and/or other countries. The microSD and microSDXC marks and logos are trademarks of SD-3C, LLC. Android and Google Play are trademarks of Google Inc. The Android robot is reproduced or modified from work created and shared by Google and used according to terms described in the Creative Commons 3.0 Attribution License. All other marks are the property of their respective owners.